At 5u we have one simple objective – to delight our customers, so that they come back to us. We do this is by putting a focus on customer service. So what does that mean? When you meet with one of our team you will not just be meeting a sales rep who has to sell a set amount every month. Why? Well, if his objective is to get the deal closed, he may not have your interest at the top of his list. At 5u our sales team is targeted on helping customers to make the RIGHT decisions. If that means the deal won’t close this month, then that is a small price to pay for building long term partnerships with our customers. 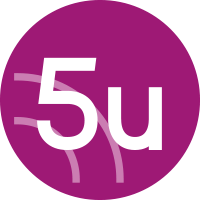 5u was founded by a team of IT leaders who felt that customers deserve better. Each founder has a different IT background – each of them started their careers over 20 years ago in technical roles. Over the years as their careers have evolved, they have developed a deep understanding of both the technical and commercial needs of provisioning IT solutions to the Enterprise, Education and Construction markets. Core to the objective of delighting customers, the founders remain as hands on as ever.